When it comes to children it is safe to say that they are experts at getting covered head to toe in mud! In addition to this, the areas that are often found in playgrounds are shaped oddly which makes laying down a safe material rather difficult. On the other hand artificial turf offers a soft, durable and clean surface that can be cut to any required shape, making it perfect for playgrounds. Whilst parks for dogs aren’t common place in the UK like they are in America it does not mean that artificial grass wouldn’t be beneficial in parks that often have four legged visitors since the grass is mud free, cannot be dug up and is nontoxic! As one of the most common places to find artificial turf, we decided to add back gardens to this list since they offer so many benefits being there! If you aren’t convinced, all you have to do is picture your backyard perfectly green yet completely natural looking in the summer and you’ll be sold! Whether you want your full yard covering or only a small section, artificial grass has got you covered. Artificial grass began its life in sports fields back in the 1960’s so it is no surprise to find that they are still being installed there to this day. In fact, they have gone from American football stadiums to golf courses, baseball pitches and beyond! The idea is that the turf allows for an equal and fair game. Whether you’re looking to spruce up your golf course or find yourself unamused at the prospect of dealing with a stained and bare lawn every summer, the team here at Great Grass have got you covered! 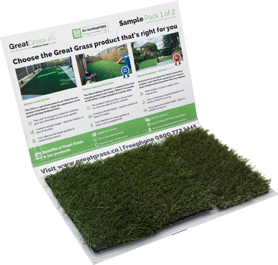 Our artificial grass not only looks natural and realistic; it feels it too! For more information, speak to a member of the team today!